Our Sense of Sight: Part 3. PLUS: "TRY YOUR OWN EXPERIMENT!" To view the Teacher Guide and Student Guide, you must have the free Adobe Acrobat Reader. Students learn some ways to investigate color vision and find out how to plan and conduct their own experiments. In the "CLASS EXPERIMENT," students discover that afterimages occur because of properties of cells in the retina and because of the way nerve pathways carry color information to the brain. They learn basic facts about photoreceptors, nerve connections, and opponent colors. In "TRY YOUR OWN EXPERIMENT," students design experiments, investigating, for example, how skillful people are at distinguishing gradations of color and how color helps us discern objects in a scene. SUGGESTED TIMES for these activities: 45 minutes for introducing and discussing the activity, 45 minutes for the "Class Experiment;" and 45 minutes for Explor Time and "Try Your Own Experiment." Seeing things in color is something we take for granted, unless we know someone who is colorblind and we become aware of the difficulties this presents. Color vision is not only a pleasurable experience, it also helps us locate and identify objects in the visual scene that would be hard to pick out in shades of gray. The ability to discern different wavelengths, or colors, of light gives us more information for detecting and identifying objects than would be provided solely by black and white vision, as demonstrated in Figure 1. Have you noticed that as daylight fades or as room lights dim, colors become hard to identify? Color vision is mediated by specialized nerve cells in the retina called cones, which function only in bright light. When light becomes dim, rods take over, and these provide neither color vision nor high acuity (ability to detect fine detail, such as that needed for reading). Cones and rods are types of photoreceptors. How do cone photoreceptors begin the process by which we perceive colors? As discussed in an earlier unit (see the Background section for Our Sense of Sight, Part 1), both rods and cones contain a visual pigment. This pigment molecule, which is embedded in the cell membrane of the photoreceptor, is a large protein called an opsin, and it is coupled with a small molecule called a chromophore (a form of Vitamin A) that absorbs photons of light. When the chromophore absorbs light, it changes shape, and this in turn activates the large opsin molecule. In domino-like fashion, this leads to a cascade of molecular events that culminates in an electrical change in the cell membrane. The electrical signal is transmitted to retinal ganglion cells, whose axons take the information about light, now encoded as electrical signals, to the brain. If all photoreceptors had the same pigment, however, we could not distinguish different wavelengths (i.e., colors) of light. To understand this, consider light of a given wavelength, say somewhere in the green region of the spectrum, falling onto a photoreceptor cell. The cell gives a certain response, perhaps 20 arbitrary units. If a blue light of the same intensity strikes, the cell may give a response of 10 units, because the blueness gives it a different quality from the green light. But if the intensity of the green illumination is reduced to the point where the cell gives a response of 10 units, the cell will code this input the same as a brighter blue light: the color information is unclear. Because photoreceptors, like all neurons, can only signal a change by increasing or decreasing their electrical output, the signals are ambiguous as to whether the change in response (here, 10 units vs. 20) is due to a difference in wavelength or in intensity. So with only one visual pigment, we would see the green light that gave a 20 unit response as brighter than the blue, but we would not see them as different colors. Researchers tell us that, in principle, three pigments, or three types of photoreceptor cells with different combinations of three pigments, could produce vision capable of detecting all colors of the visible spectrum (400 to 700 nanometers). Scientists have indeed found that the human retina (and a few others) has three types of cones, each containing a different visual pigment. These are the red, green, and blue cones, each containing a pigment similar to rhodopsin, the pigment found in rods. Each cone pigment is an opsin, but the opsins have different amino acid sequences that restrict the accompanying chromophore (in a yet unknown manner) so that it preferentially absorbs only one part of the visible spectrum. Thus, red cones absorb longer wavelengths, green cones medium wavelengths, and blue cones shorter wavelengths. Each type of cone cell responds to a range of wavelengths rather than just one, and their response curves overlap (Figure 2). 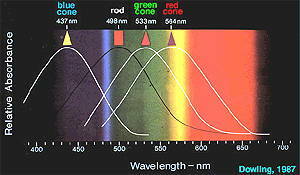 Because of this overlap, each wavelength of light gives a unique pattern of response in each of the three cone populations, and the pattern of signals is the code for the wavelength, or color. That is, the color is encoded in the pattern of activity of a number of cells rather than in the isolated activity of one cell. This mechanism is similar to that for olfactory perception: individual olfactory receptors give different responses to the same odor, and the odor is coded by the pattern of receptor activation. Many animals do not have color vision: the ability to discern different wavelengths evolved in animals that became diurnal, or active in the daytime. Among these, birds are especially color sensitive. Some have four or more cone pigments, allowing them to distinguish more accurately among colors than we do (probably seeing more shades), and to see into the ultraviolet range, which we cannot. Most primates other than humans have just two visual pigments, one for short (blue) wavelengths, and one that varies in different animals but detects light somewhere in the red to green part of the spectrum. Familiar animals such as dogs and cats also have two types of cones. Old World monkeys have three cone types, as humans do. Some invertebrates have color vision: like birds, some insects can see ultraviolet light. Insects also have different screening materials in the corneal covering of their eye facets; this allows for tuning different eye units (called ommatidia) to different wavelengths. Like other visual information, signals coding color travel from the retina, via axons of the ganglion cells, to the lateral geniculate nucleus of the thalamus. Axons from color-processing cells in the geniculate are connected to color-detecting cells in the visual cortex, in the occipital lobe at the back of the brain (Figure 4). Within the occipital lobe, cells in the primary visual cortex, often called "area 17" by researchers, are the first to receive messages from the geniculate. Signals conveying color information then go on to several nearby visual areas for further processing, mainly to an area termed "V4." For perception and recognition, signals are then sent to so-called "higher centers," where they interact with stored memories and input from other sensory and motor centers. One "set" of information is spatial and goes mainly to the parietal lobe, while a second "set" concerned with object recognition and color perception goes to the lower part of the temporal lobe. However, scientists have also found that even when these parietal and temporal lobe areas are damaged, people can perform tasks involving spatial relationships, object recognition, and color information, so the brain must also process this visual data in additional places. Scientists are able to explain some curious features of color vision, even though all of the mechanisms are not yet fully understood. These features include successive color contrast, simultaneous color contrast, and color constancy. The "opponent-color theory" helps explain these phenomena. The following summaries are quite sophisticated and should be simplified for younger middle school students. Researchers studying color perception noted that certain colors could not be seen in combination; for example, we do not see colors called "red-green" or "blue-yellow." Therefore, these colors, along with black and white, were described as opponents or antagonists. Scientists also observed that a certain combination of red (long) and green (medium) wavelengths produced the color yellow. They could verify that this combination would be equivalent to a third wavelength, but could not explain why this combination looked yellow instead of "reddish-green." The opponent-color theory formulated in the 1960s, accounts for some of these observations. Researchers believe that, starting in the retina, information about color and about intensity of light is sorted into three "channels." The channels consist of axon pathways from retinal ganglion cells, which receive all cone information, to the brain. Two of these channels carry color or wavelength information, and one carries intensity information-the degree of blackness or whiteness. As shown in Figure 5, each ganglion cell receives input from a defined set of cones, and when a ganglion cell gets the necessary signal combination to activate it, it sends a message that indicates a particular color. Thus, a "blue" ganglion cell, one that only signals "blue" to the brain, fires a message when it receives input from blue cones but no input from green or red cones. A "yellow" ganglion cell sends its "yellow" message to the brain when activated by a certain pattern from green and red cones, but no messages from blue cones. Remember that while yellow is signaled by activation of both red and green cones, the message "yellow" travels in the same pathway, or nerve fiber bundle, as the message "blue," and these two (yellow and blue) cannot travel at the same time, so we do not see "blue-yellow." The messages "red" and "green" are sent by different ganglion cells from those that send "yellow," even though all these are receiving information from (different) red and green cones. Because red and yellow are transmitted in separate channels, we can simultaneously see red and yellow (orange), and for the same reason, we can see red and blue (magenta), blue and green (aqua) and yellow and green (lime). Figure 5. Simplified diagram (after McIlwain, 1996) of how colors might be perceived based on the opponent-colors theory. See text for explanation. 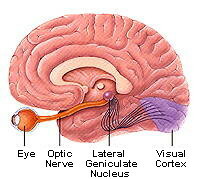 This diagram ignores the internal retinal circuits. Try comparing the opponent color channels to tubes that can only carry one kind of marble at a time. For example, one tube carries both red marbles (red light) and green marbles (green light), but only one type can travel through the tube at a time. When red marbles come out the end of the tube, they hit a switch in the brain and turn it on, signaling red, while the green marbles signal green. Because only red or green can travel at one time, we cannot see colors that are combinations of red and green ("red-green"). Blue and yellow marbles would have their own separate tube, so we can see blue and green, or red and yellow, at the same time: both tubes can work simultaneously. This explanation leaves out the fact that yellow is a combination of red and green wavelengths-the yellow marbles are a simplification. If you look at a bright red circle for a time and then at a gray or white background, you see a green circle or afterimage (and similarly, you see a red afterimage for an initial green object.) The opponent-color theory helps explain this phenomenon. Prolonged viewing of the red stimulus causes adaptation in the red-selective cones: like other primary sensory cells, they stop firing if bombarded for too long with a stimulus. When the retina is subsequently exposed to a white light (reflected from the white or gray background) the red cones are unable to fire for a short time, and the ganglion cells connected to these cones decrease their firing. The green cones are not fatigued, so the ganglion cells receiving green light send messages through the red-green channel, and the brain receives only a green signal. For the red-green channel to signal "white," it must receive signals from both red and green, which then "cancel" each other. Other pairs of colors will also give color afterimages: blue and yellow, and black and white. Further, different shades of initial colors will give different shades of their afterimage colors. Figure 6. Afterimages: Stare at the yellow + in the middle of the figure on the left for 15-30 seconds. Then move your gaze to the white square. Did the colors reverse themselves? Try the same with the red and green figure. These are examples of "afterimages." See text for explanation. Another visual phenomenon is observed when a gray object seen against a background of green has a red tinge, and vice versa. The mechanism also begins in the retina, where messages are funneled into their appropriate channels, but the explanation is more complicated. The information is transmitted to special cells in the visual cortex called "double opponent" cells. These cells respond best to opponent colors in a certain spatial arrangement, such as a red spot in a green background, or the reverse. Researchers think this response characteristic of the visual cortical cells helps produce the green tinge seen with a gray object in a red background: the double opponent cells "fill in" the green circle because that is what they are "programmed" to see. This phenomenon is not yet fully understood. Researchers also believe that double opponent cell activity is responsible for the fact that an object seems to remain the same color in spite of changing light conditions, say, from bright daylight to dusk, or from sunlight to artificial light. This has to do with the fact that to a great extent, we judge color by comparing the object and its background: the entire retinal image is taken into account by our brains. However, we have all had the experience of buying an article of clothing that looks one color in the artificial lighting of a store, but appears to be a different shade in sunlight. In this case there is no constant background for comparison. In a further apparent exception to the color constancy rule, a set of objects reflecting identical wavelengths from their surfaces (for example, red light-they should all look red) can appear to be completely different colors if set against different backgrounds, or when using different ambient lighting conditions. Although we speak of "color blindness," it is extremely rare for a person to see no colors at all; rather, these people usually either cannot detect one color, or they perceive it differently from the normal population. Researchers have determined that these defects are generally genetic, and involve the photoreceptor pigment genes. The genes for the red and green pigments are both on the X chromosome, quite close to one another, and because men have only one X chromosome, they are more likely to be missing one gene or to have a recombined and thus abnormal gene; approximately 2% of men are red-green colorblind. Mutations in blue cone pigment genes are unusual: this gene is on chromosome 7, so everyone has two copies and both would have to be defective in order for a problem to occur. Approximately eight percent of males, and fewer than one percent of females, have some difficulty with color vision. Acquired defects in color vision can be caused by lesions (such as hemorrhages from stroke or accident, or tumors) in area V4 of the visual cortex. These must usually occur on both sides of the brain to affect color vision. First, prepare students for lab activities by giving background information according to your teaching practices (e.g., lecture, discussion, handouts, models). Because students have no way of discovering sensory receptors or nerve pathways for themselves, they need some basic anatomical and physiological information. Teachers may choose the degree of detail and the methods of presenting color vision, based on grade level and time available. While students do need direction and practice to become good laboratory scientists, they also need to learn how to ask and investigate questions that they generate themselves. Science classrooms that offer only guided activities with a single "right" answer do not help students learn to formulate questions, think critically, and solve problems. Because students are naturally curious, incorporating student investigations into the classroom is a logical step after they have some experience with a system. The "Try Your Own Experiment" section of this unit (see the accompanying Teacher and Student Guides) offers students an opportunity to direct some of their own learning after a control system has been established in the "Class Experiment." Because students are personally vested in this type of experience, they tend to remember both the science processes and concepts from these laboratories. To encourage student participation in planning and conducting experiments, first provide Explore Time or Brainstorming Time. Because of their curiosity, students usually "play" with lab materials first even in a more traditional lab, so taking advantage of this natural behavior is usually successful. Explore Time can occur either before the Class Experiment or before the "Try Your Own Experiment" activity, depending on the nature of the concepts under study. Explore before "Try Your Own Experiment"
To use Explore Time before Try Your Own Experiment, follow the procedure above, adding the new materials for student-generated experiments. Let the students suggest a variety of ideas, then channel their energies to make the lab manageable. For example, when a number of groups come up with similar ideas, help them formulate one lab question so that the groups can compare data. The goal is to encourage students to think and plan independently while providing sufficient limits to keep the classroom focused. The Teacher and Student Guides contain detailed suggestions for conducting good student-generated experiments. Bellamy, M.L. and Frame, K. (Eds.) (1996). Neuroscience Laboratory and Classroom Activities. National Association of Biology Teachers and the Society for Neuroscience, pp. 239-257. Kandel, E.R., Schwartz, J.H., and Jessell, T.M. (Eds.) (1991). Principles of Neural Science. Third ed., New York: Elsevier Science Publishing Co.
McIlwain, J.T. (1996). An Introduction to the Biology of Vision. Cambridge, UK: Cambridge University Press. Shepherd, G.M. (1994). Neurobiology, Third ed. Oxford: Oxford University Press. The Benchmarks are listed by chapter, grade level, and item number; for instance, 1A, 6-8, #1 indicates Chapter 1, section A, grades 6-8, benchmark 1. Scientific investigations usually involve the collection of relevant evidence, the use of logical reasoning, and the application of imagination in devising hypotheses and explanations to make sense of the collected evidence. If more than one variable changes at the same time in an experiment, the outcome of the experiment may not be clearly attributable to any one of the variables. Know that hypotheses are valuable, even if they turn out not to be true. Know that often, different explanations can be given for the same evidence, and it is not always possible to tell which one is correct. Keep a notebook that describes observations made, carefully distinguishes actual observations from ideas and speculations about what was observed, and is understandable weeks or months later. All living things are composed of cells. Different body tissues and organs are made up of different kinds of cells. The cells in similar tissues and organs in other animals are similar to those in human beings. Like other animals, human beings have body systems for the coordination of body functions. Organs and organ systems are composed of cells and help to provide all cells with basic needs. Interactions among the senses, nerves, and brain make possible the learning that enables human beings to cope with changes in their environment. The nervous system works by electrochemical signals in the nerves and from one nerve to the next. Human beings can use the memory of their past experiences to make judgments about new situations. Human beings can detect a tremendous range of visual and olfactory stimuli.